Sweet berries and earthy beetroot combine in this pretty-in-pink smoothie. 1) Pass the beetroot through a juicer and collect the juice. The yield should be approximately 1/2 cup. 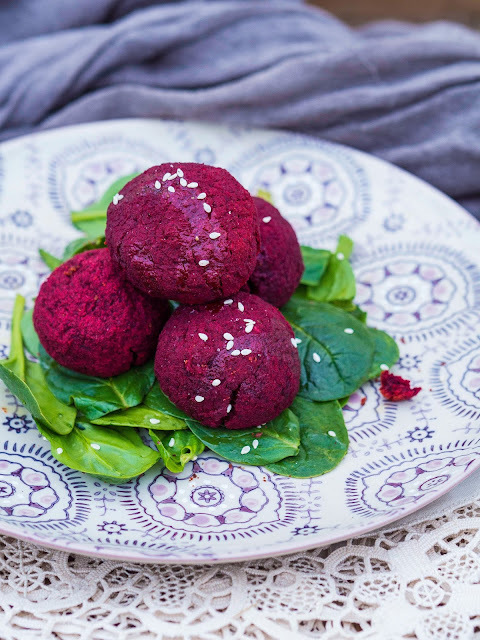 2) Place the beetroot juice in a blender along with the other ingredients and blend until smooth. Enjoy immediately. I've been drinking green juices a lot lately and really feel that they've been beneficial to my overall health and wellbeing. I love experimenting with different flavour combinations and this one features zesty lime and fiery ginger for a subtle kick. 1) Starting with the ginger, feed the ingredients through a juicer. Enjoy immediately. I've wanted to create a healthy Spinach and Artichoke Dip for some time now. 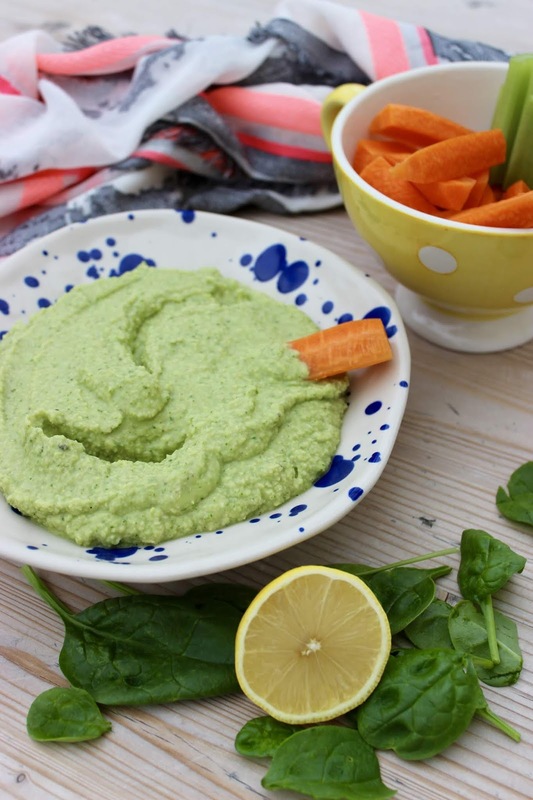 I love both of the key ingredients and it's no secret that I love to whip up a dip on a weekly basis, switching up the flavours to keep things interesting, for an easy snack, spread or addition to nourish bowls. That's part of the reason why I wanted to create this recipe, the other being the fact that most spinach & artichoke dips are either baked, or laden with unnecessary creamy ingredients, or a combination of both- neither of which particularly appeals to me. Necessity is the mother of invention, after all. 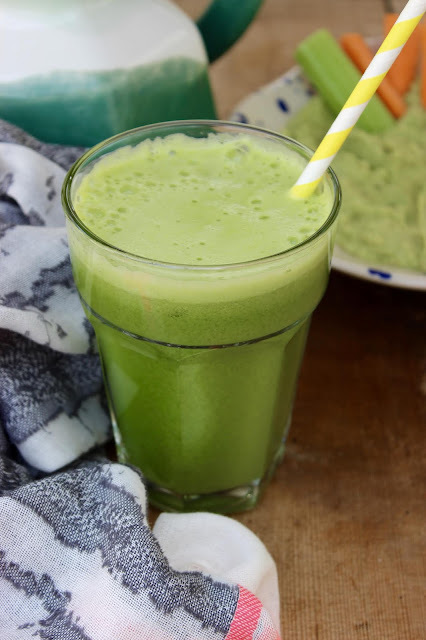 This version isn't just delicious but also packed full of goodness- just one example being the fact that the lemon juice will aid in the absorption of iron from the raw spinach. I'm all about optimising ingredients' benefits. This recipe is admittedly a little heavier on the ingredients, for a dip at least, but makes a big batch which will serve you well whether you're entertaining or simply want to meal (snack?) prep for the week ahead. This sweet, fresh and creamy smoothie is perfect for summer- it even tastes of sunny days! What's more, it packs in three portions of fruit and vegetables. 1) Blend all of the ingredients together until smooth and enjoy immediately. One of the aims of Halo Eats, which I really hope to achieve, is proving to people that healthy eating isn't about deprivation- whether it be the ever popular "Nutella" Brownies (recipe here) or today's savoury recipe, I'm all about showing that you can, of course, indulge. For me, peanut butter is one such way to indulge- my obsession is ever growing and I love experimenting with the rich butter in savoury recipes as well as the classic sweets. My Peanut Butter Curry (recipe here) continues to prove popular and I recently trialled the ingredient with an oriental twist, the result being today's recipe. 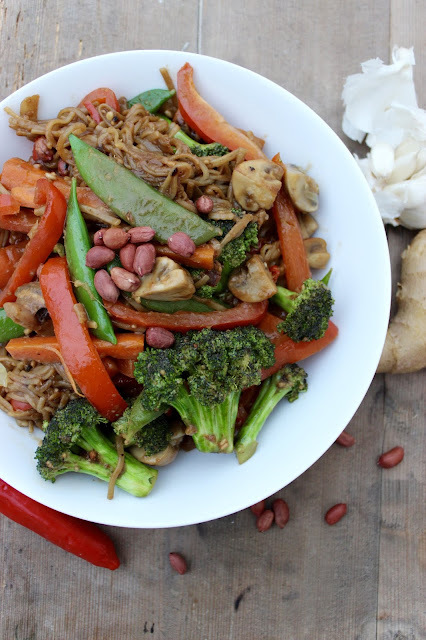 This stir fry is packed full of flavour, whilst also being high on the veggie content. It's quick and easy to prepare in one pan, making it an ideal mid-week meal for those days when you're short on time but don't want to forgo delicious and healthy food choices. There's a depth of flavour to it- creamy nuttiness, fiery ginger and a slight kick of spice and the combination of vegetables & noodles keeps the textures interesting. I really hope that you'll give this recipe a try and I'm sure that it'll become one of your go-tos! 1) Start by making the peanut butter sauce. Whisk together the peanut butter, tamari soy sauce, lime juice and maple syrup in a small mug, bowl or jug. Set aside. 2) Melt the coconut oil in a wok over a medium heat on the hob. Add the onion and lightly fry for a minute or two before adding the garlic, ginger and chilli. Lightly fry for a further minute or two. 3) Increase the heat and add the broccoli and carrot. Stir fry for a couple of minutes (add a small splash of water if required). 4) Add the mushrooms, cooked noodles, sugar snap peas and red pepper and stir fry for a further minute or two. 5) Give the sauce a quick stir and then add to the wok, stir frying for a minute. Stir through the peanuts. Serve immediately. If you're a regular follower of Halo Eats then you'll probably realise that I love harissa. I've been using the North African paste increasingly this year as it imparts such a wonderful flavour whether added to stews, side dishes or snacks (such as my Harissa Roasted Almonds). As aubergines are known for their versatility and flavour carrying properties, it made perfect sense to pair the two together, the result being today's recipe. This makes for a quick and easy dinner with a side of quinoa (try it with my Jewelled Herby Quinoa) but as it's equally delicious served hot or cold, I also enjoy it as a salad or addition to a nourish bowl the following day. It has a tangy citrus flavour with smokey harissa and a hint of spice which I hope you'll love as much as I do! 2) Place the aubergine on a baking tray. 3) In a bowl, mix together the harissa paste, olive oil, maple syrup, lemon juice and salt & pepper. Pour over the aubergine, ensuring that all of the pieces are evenly covered in the sauce. 4) Bake for 25 minutes, turning halfway through the cooking time. This is the perfect mid-week meal in minutes. It's quick and easy to prepare, with few ingredients (most of which are "store cupboard essentials") and yet is satisfying and so flavourful. 1) Prepare the pasta according to packet instructions. 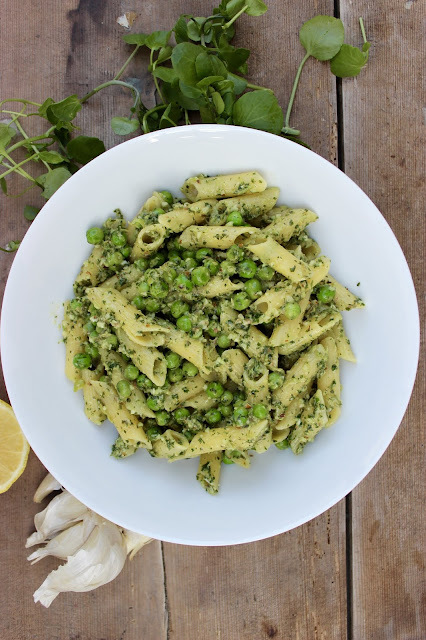 2-3 minutes before the end of the cooking time, add the peas to the same saucepan and boil together with the pasta until cooked. Drain and return to the saucepan. 2) While the pasta is cooking, make the watercress pesto. Whizz the almonds in a food processor until finely chopped (but not "breadcrumb" texture). Add the garlic and whizz again, followed by the watercress, lemon juice, olive oil and salt & pepper. Stir into the pasta and peas. Enjoy immediately. 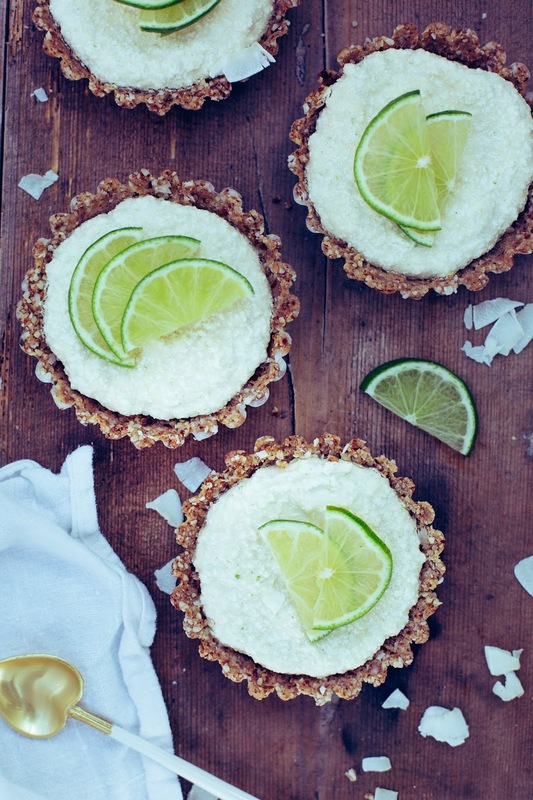 These individual key lime pies make for an impressive dessert that never fails to delight- even those who aren't accustomed to this way of eating seem to enjoy these creamy and zesty indulgent treats and I've received so many requests for the recipe. 1) Grease 8 mini tartlet tins with a little coconut oil. 2) Start by making the pie crust. Place the almonds in a food processor and whizz until they resemble "breadcrumbs". Add the coconut flakes and salt and whizz to combine. 3) Add the medjool dates and whizz until the mixture sticks together. Separate into 8 equal portions and press into each of the prepared tartlet tins. Place in the freezer to set. 4) Meanwhile, place the soaked cashews in a clean food processor and whizz to break up. Add the remaining ingredients and whizz together until smooth and creamy. Pour, in equal portions, into the prepared tartlet tins/ cases and freeze until set. Remove from the freezer at least 10 minutes before serving. Decorate as desired. en a very subtle spice thanks to the inclusion of chilli. It really livens up the broccoli but you'll also probably be left with a little of the sauce, which can be kept refrigerated in an airtight container for a few days. Three great health benefits: boosts immunity, promotes healthy skin, good source of fibre. 2) Place the chopped red pepper and garlic clove in a roasting tin and drizzle with 2 tsp of the olive oil. Roast for 20- 25 minutes. Remove from the oven and set aside. Peel the garlic (be careful if you do this while it's hot!). 3) To make the Romesco Pepper Sauce, whizz together the roasted red pepper (along with any oil from the roasting tin), garlic, chilli, ground almonds, apple cider vinegar, 1 tbsp extra virgin olive oil and salt & pepper in a food processor. Set aside. 4) Next, heat 1 tbsp of the olive oil in a large pan or wok over a medium heat on the hob. Add the broccoli and stir fry until cooked but still firm. 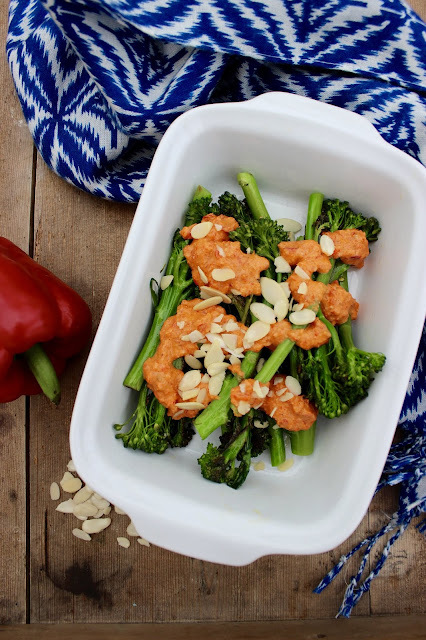 Place on a serving dish and drizzle with the Romesco sauce & sprinkle with the flaked almonds. This fresh and flavourful salad is simple to prepare but so delicious. 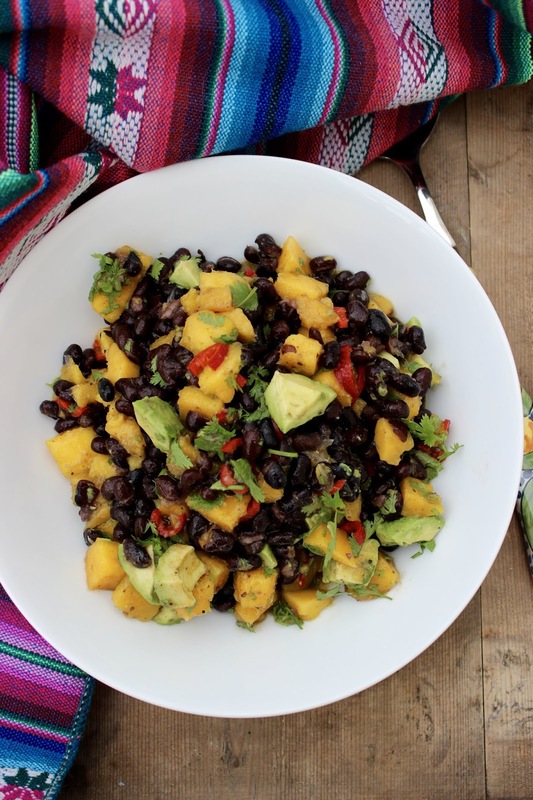 It's satisfying, without leaving you feeling bloated, and perfect for summer. I originally intended this to be a side dish but the reality is that I love it equally on its own or as a side dish and really hope that you'll enjoy it as much as I do. 1) In a large bowl, combine the black beans, mango, chilli, lime juice, olive oil and salt & pepper. Set aside for a few hours. 2) Immediately before you're ready to serve the salad, stir in the avocado and coriander. This spicy and flavourful salad, which can be served hot or cold, is topped with the most delicious dressing which I'm sure you'll love as much as I do! 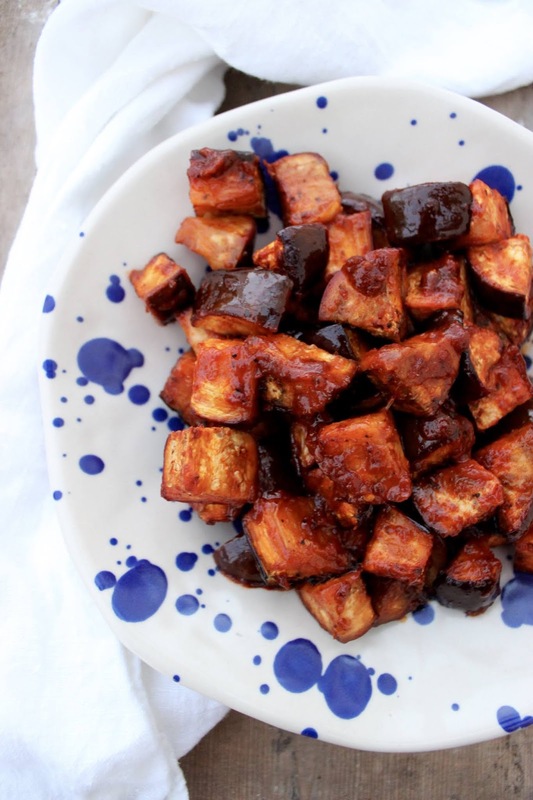 2) Place the aubergine in a roasting tin, drizzle with 2 tbsp of the olive oil and sprinkle with the paprika and cumin, ensuring that all of the pieces are evenly coated. Season with salt & pepper. 3) Roast the aubergine for 15 minutes then add the chickpeas and a further 1 tbsp of the olive oil, ensuring that all of the chickpeas and aubergine are evenly coated. Roast for a further 15 minutes. Remove from the oven and set aside to cool. 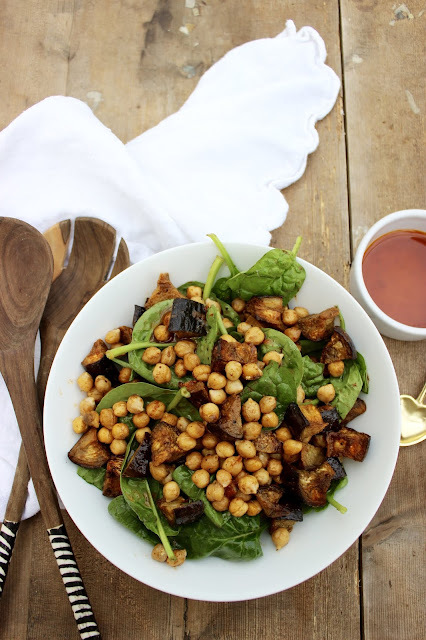 4) When the aubergine and chickpeas are cool, toss with the spinach. 5) To make the Harissa Dressing, whisk together the olive oil, lemon juice, maple syrup and harissa paste. Drizzle over the salad to serve.